Ambiente Blog • A natural movement towards a calming oasis. 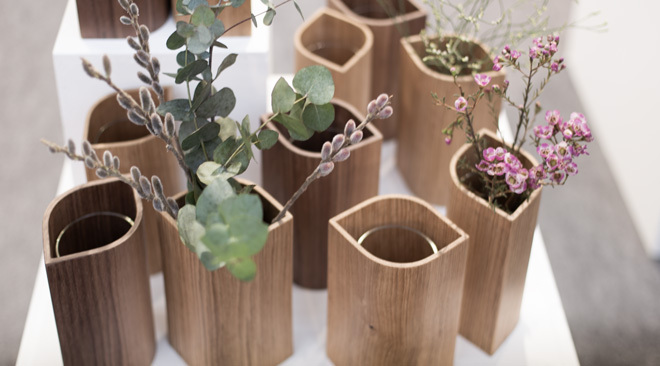 Sustainable, ethical, natural, recycled; for me these were the stand-out elements of Ambiente. Simple, practical designs drawing on nature for inspiration in the home. Time and again, I became more and more aware of how the use of natural materials is increasingly making an impact on how we decorate and furnish our homes and live our lives. Hello! My name’s Niki Brantmark. Originally from London, I live in Malmö, Sweden and am the creator of My Scandinavian Home – an award-winning daily interior design blog. I am also the author of three books: “Lagom, The Swedish Art of Living a Balanced, Happy Life”, “The Scandinavian Home” and “Modern Pastoral, Bring the Tranquility of Nature into your Home“. 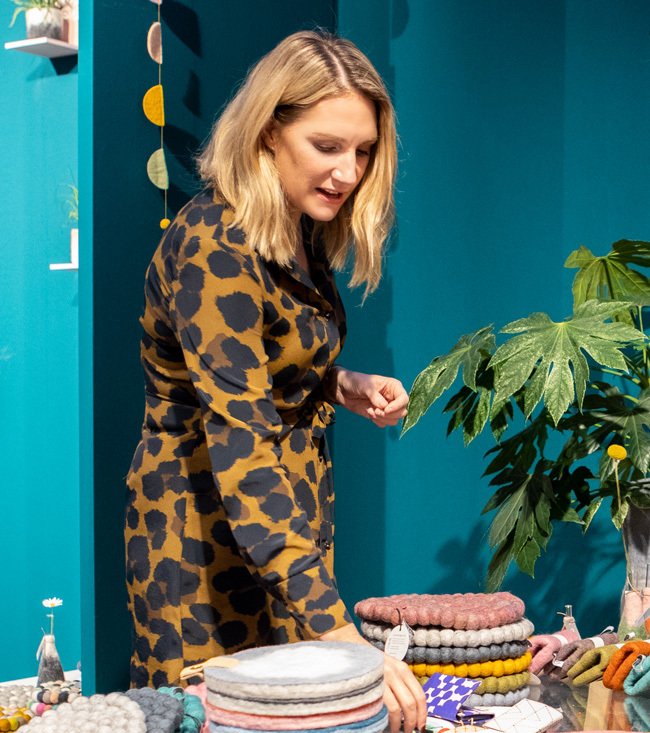 Visiting fairs breathes life into my work: it’s where I learn about new trends, find out about the latest design news and meet with designers and other people in the field. 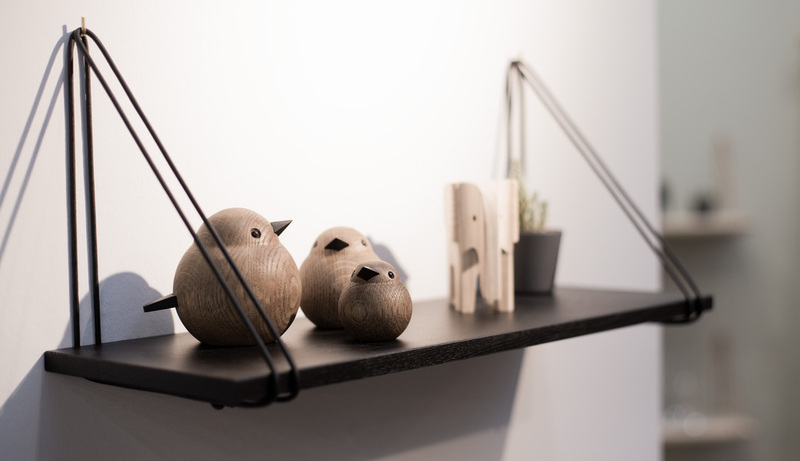 I was incredibly excited to visit Ambiente for the first time this year. I am the type to rush about at a hundred miles an hour with my camera – especially with so much to see! However, with over 4,400 exhibitors from 88 countries to explore – not to mention trend areas and special talks I knew I’d need to pace myself! Ambiente exceeded all my expectations (and they were high!). I spent a great deal of time exploring the exhibits, chatting to designers to hear the stories behind the products and also visiting the Show. So, what will people feel inspired by in 2019? While some may opt for a ‘tasteful residence’, a trend characterised by rich colours, sensual materials and pure lines, others might veer towards a ‘joyfilled ambience’ – mixing patterns, colour and textures in a playful way. And then there are others looking to create a ‘quiet surrounding’ – a calm, purposeful sanctuary away from the hustle and bustle of everyday life. Importantly, all three trends have an underlying theme of sustainability, naturalness and recycling. I felt particularly inspired by the ‘quiet surrounding’ trend and the idea of creating a calm oasis – a theme that stuck with me as I explored the fair. Here are some of my favourite discoveries. At a time where we’re experiencing rapid climate change, I felt encouraged by how the interior world has responded. Having lived in Scandinavia for the past 15 years, I have a great appreciation for all things natural and items that are beautifully crafted in order to withstand the test of time. Looking at the exhibits, I noticed there was a distinct movement towards the use of more sustainable or recycled materials, and a greater appreciation of the nature around us: drawing it indoors so that we can reconnect with nature in new ways. It’s been well documented that nature helps us to feel calmer, less stressed and happier. In a demanding world in which we find ourselves connected 24/7, creating an indoor oasis in which to recuperate has become increasingly important. As we move towards more natural materials it’s inevitable that the colours also become muted and earthy. Think moss green, Baltic blue and burnt earth hues such as umber, ochre and sienna that represent the rich colours of the world around us. Embracing colours that are inspired by nature help us to escape the hectic constraints of modern life and create our very own calming sanctuary – and can also add to the cosy feel of a home. When it comes to the home, there are many benefits of using natural materials especially if you’re looking to create somewhere welcoming and comfortable in which to recharge your batteries. So, why is this? Items made from natural materials tend to contain less toxins and are more hypoallergenic, and since they come from a chaotic environment, they are designed to survive the elements. 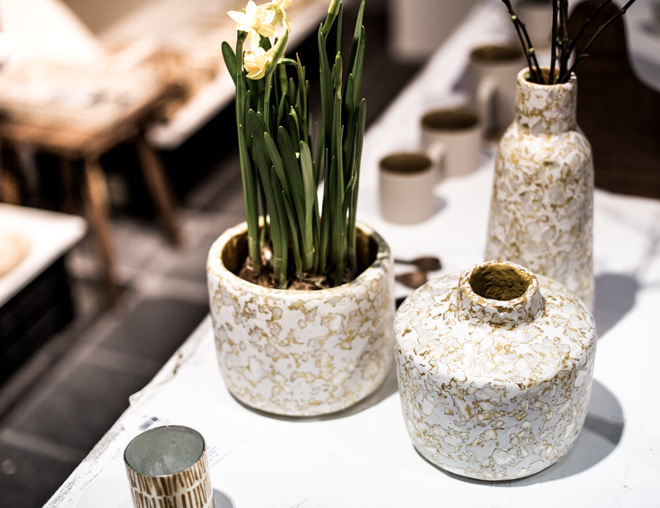 I was excited to discover designers exploring natural materials such as wood, stone, glass paper, cotton and clay, as well as experimenting with recycling waste – resulting in items that will add an abundance of texture to the home in subtle ways. Plants and flowers could be found throughout the fair – and pop up in many of the pictures I featured here. Studies have shown that having just one plant in a room can ease stress levels, absorb harmful toxins and help purify the air. It’s also a wonderful way to bring your home to life. 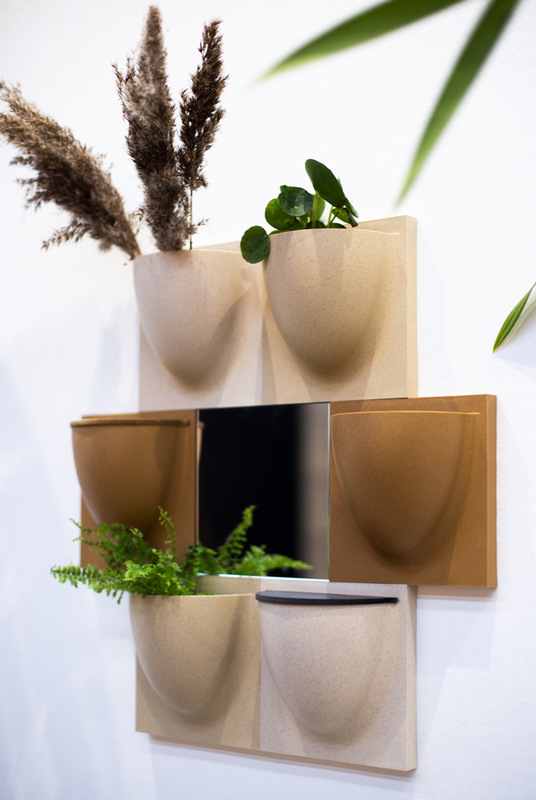 From classic plant pots and plant stands to wall-mounted and hanging plant holders – the exhibitors at Ambiente demonstrated that the way we can display plants in our home is endless! You’ll recognize this theme time and again as you take a tour through my discoveries! Take the most simple of spaces and add wood and you’ll feel instant warmth. Why? Wood offers that ultimate back-to-nature feel. It has a warm colour tone and a patina that adds texture and depth to a space. Since it’s a natural material it also ages with grace. Every nick and scratch acquired over time tells a story and adds to the character of your home. 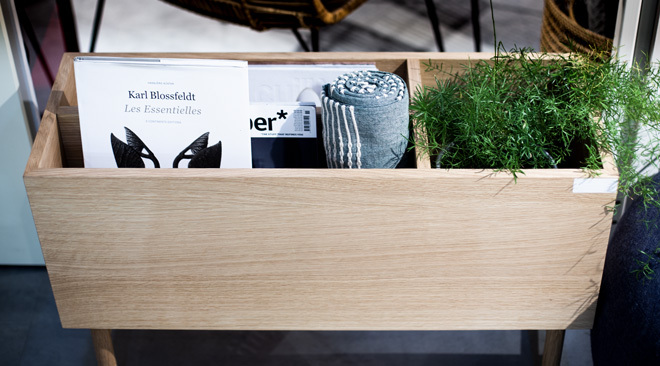 I was especially taken with the beautiful storage box by Hübsch, which would be useful in any room of the house and wooden vases by made by Bent for an ultimate ‘spa-like’ feel. 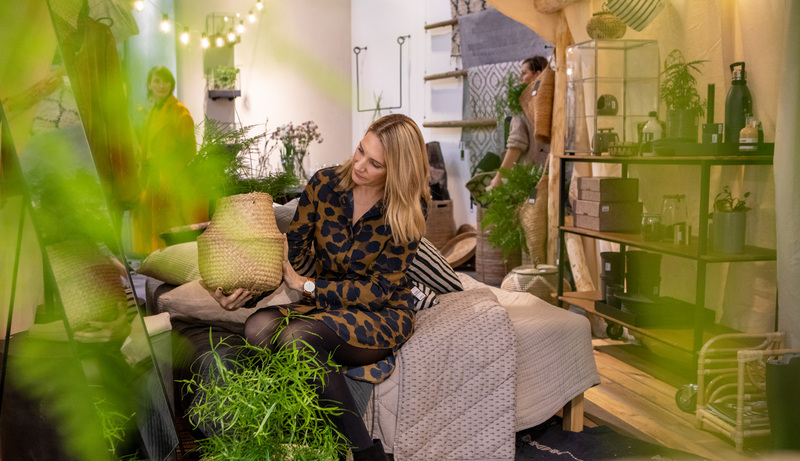 In recent years, rattan has emerged in homes as one of the driving forces behind the boho modern trend – an obvious choice thanks to the 1970s throw-back. As someone who has had a peacock chair in the corner of my bedroom since childhood, I always feel nostalgic when I come across any items made from the thin jointed stems of a palm. 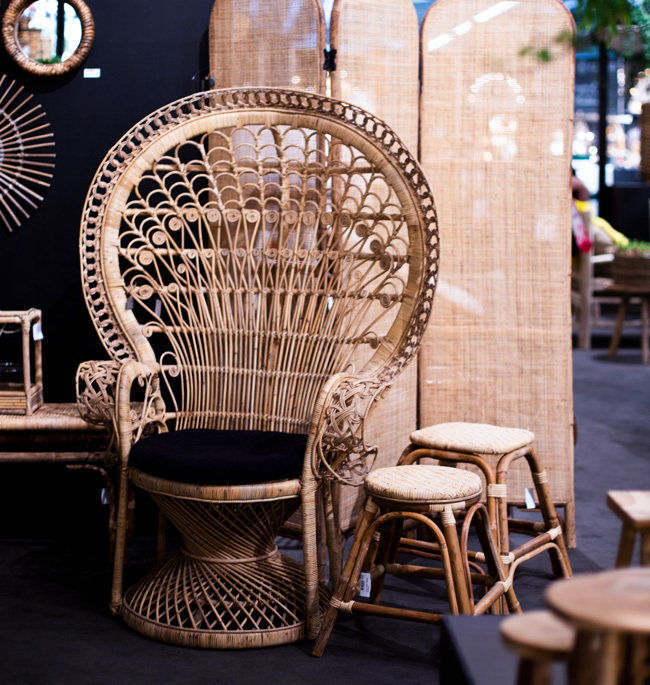 At Ambiente there were baskets aplenty – as well as stools, screens, and of course a few fabulous peacock chairs waiting to add an exotic, bohemian twist to the home! Living in Scandinavia, I have a huge passion for Nordic time-honoured traditions and handicraft. 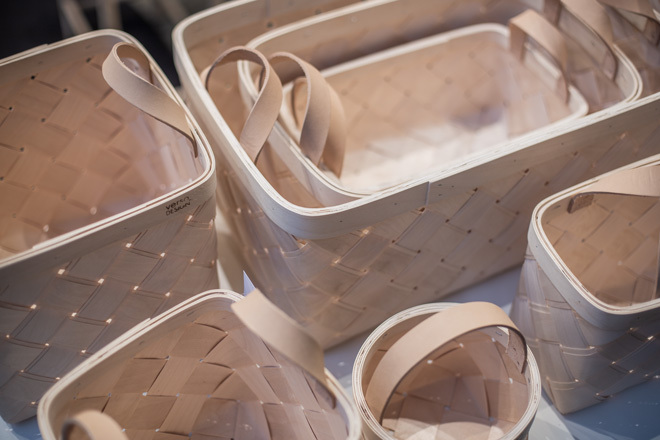 It’s not uncommon to find baskets made from woven birch – but I was especially excited to discover a modern take on a true Finnish classic: the woven birch basket. Finnish brand Verso Design have used two layers of birch instead of a single one to create the birch basket and topped it off with wool felt handles for a more durable piece. The sturdier design will no doubt ensure it’s a basket that can be passed down from generation to generation. Southern Sweden is famous for its light – which attracts many artists to the area. In areas like Österlen, it’s not unusual to see signs along the road indicating small ceramic studios, from where local ceramicists create and sell their work. Although not from this part of Sweden, Swedish family business Lindform is also known for taking inspiration from Scandinavian nature with its organic tones and simple shapes. The form and subtle hues are designed to give harmony to a room and add an understated, decorative touch. 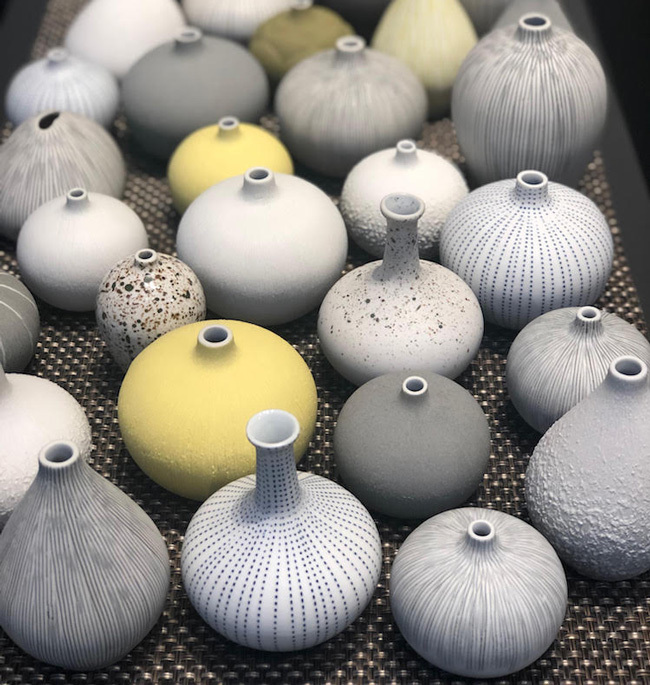 As with many ceramics I spotted at the fair, the beauty is in the detail and the texture makes you want to reach out and touch them – and savour the subtle surface differences between your fingers. Not only is wool 100% natural, it’s also flame-retardant, stain-resistant and has great thermal insulation properties. Little wonder it’s been used throughout the ages for clothing and items for the home. Products made from wool not only help a home to feel more snuggly, they also offer great sound absorption which is important when creating a calm environment. 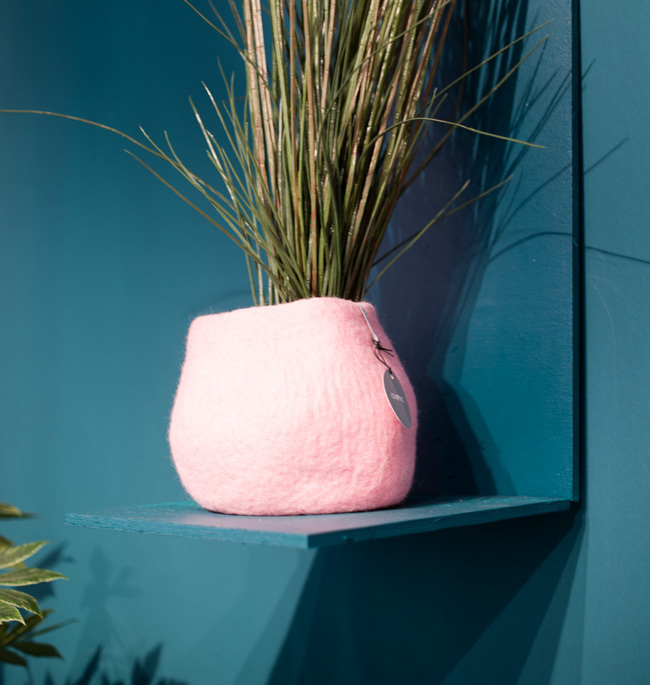 I was excited to discover these wool flower pots by Aveva Design which have a special waterproof natural rubber lining, so you can use them for plants. You only have to wander around the stationery and gift sections at Ambiente to understand just how versatile paper can be. But did you also know it can be used for plant pots and bags?! I was particularly taken by Italian family-run brand Uashmama who make items from washable paper that looks like leather but can be put through the washing machine! The sustainable paper is made using a cultivated fibre and does not contribute to deforestation. 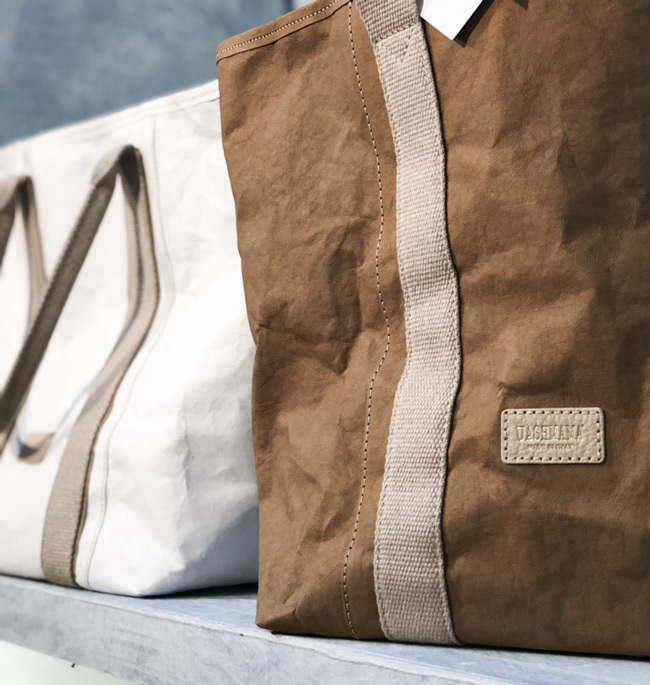 What’s more, each and every paper bag is sewn by hand in a cottage in Tuscany which helps to support artisans in the local community. Anyone who spends a copious amount of time looking at interiors on Instagram – and has a penchant for Scandinavian design (I may or may not be talking about myself!) will have noticed that linen is everywhere – and the more creased and relaxed the better! Made from the fibres of a flax plant, it’s time-consuming to produce but the fibres are incredibly strong, absorbent and dry a lot faster than cotton – plus, the material keeps you lovely and cool in warm weather. Needless to say, it’s become a staple in many homes. Looking around the fair, I came across several beautiful garments made of linen including table cloths by LinenMe who specialise in earthy, muted tones and the odd crisp white – just as linen is meant to be! Although many may think of glass as manmade, there are numerous forms found in the natural world. 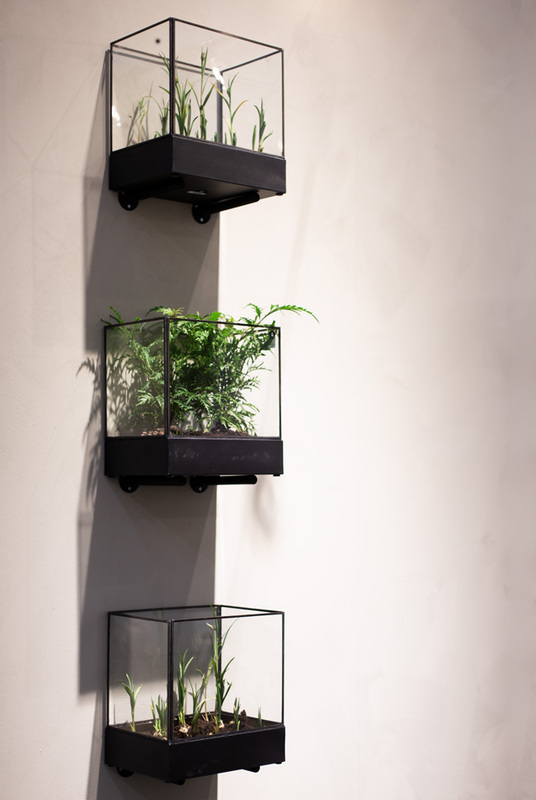 I spotted these beautiful wall-mounted glass plant holders by Danish brand House Doctor. I particularly appreciated the simplicity and practical nature of the ‘boxes’– the glass is like a window into a green world – and the container provides a new way to display blooms on the wall. Lovely! Waste is causing a huge concern. I therefore felt immensely encouraged by the number of designers experimenting with new ways to use old materials. 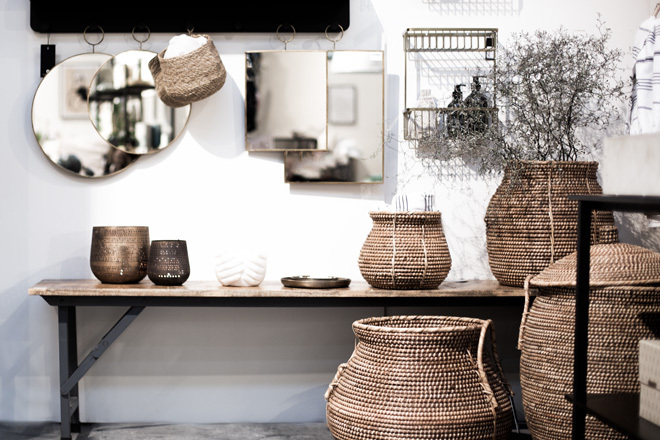 The Danish designer behind Dutch brand Kinta strives to design interior products that celebrate craftsmanship, natural materials and timeless design. 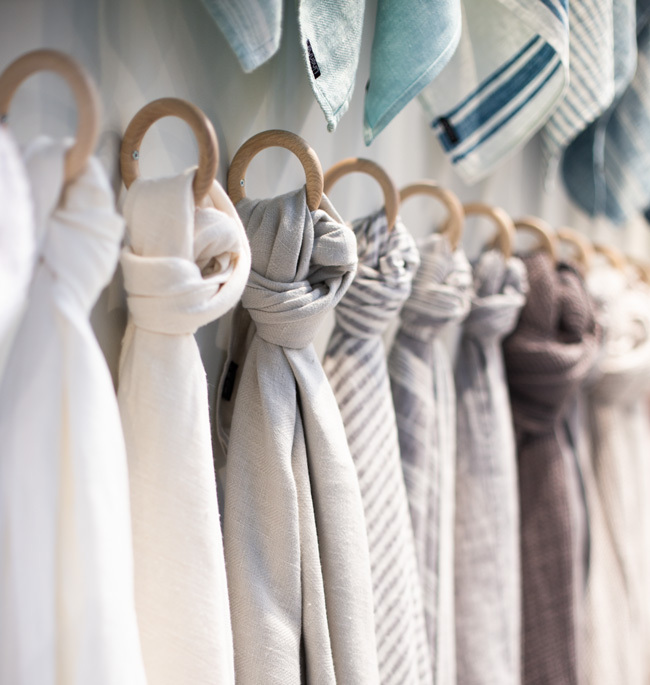 They work closely with local makers, ensuring that the production is ethical and sustainable. Several of their pots and vases are made from recycled plastic bottles. 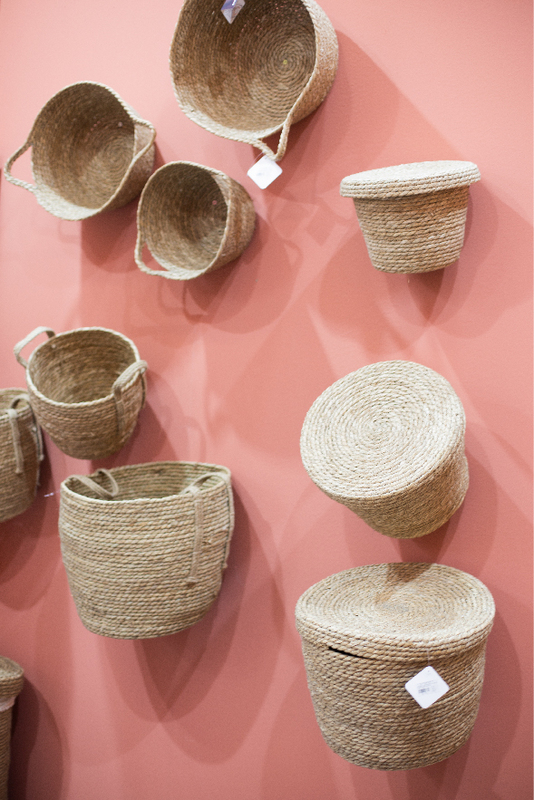 Originalhome from the Netherlands has a ‘green living philosophy’ and specialises in items for the home that are 100% eco-friendly, organic, handcrafted, fairtrade and socially compliant. 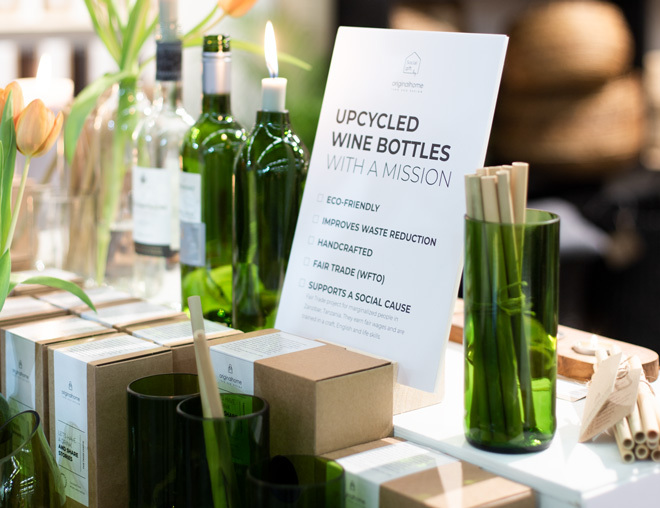 I was especially fascinated by their upcycled wine bottles! All this talk of bringing nature into your home – but what about taking your home out to nature? House Doctor set up a fun ‘glamping’ (glamorous camping) scenario on their stand which included a canvas tent, a simple bed on pallets and all the creature comforts you might need for a night out in the wild! What’s stopping us?! I walk away from Ambiente 2019 with a smile on my face, a spring in my step and truly inspired by what the future holds for the world of interiors. Thank you so much for inviting me, I can’t wait until next year.